I don't profess to be an expert machine quilter; I am merely one who is comfortable with what she is doing. I enjoy both the process and the result. Because it is unmarked, my stitching is not always even and frankly, I like it that way. To my eye, it gives a charming look, one which signals that the stitching is not computerised but that each has been done individually. 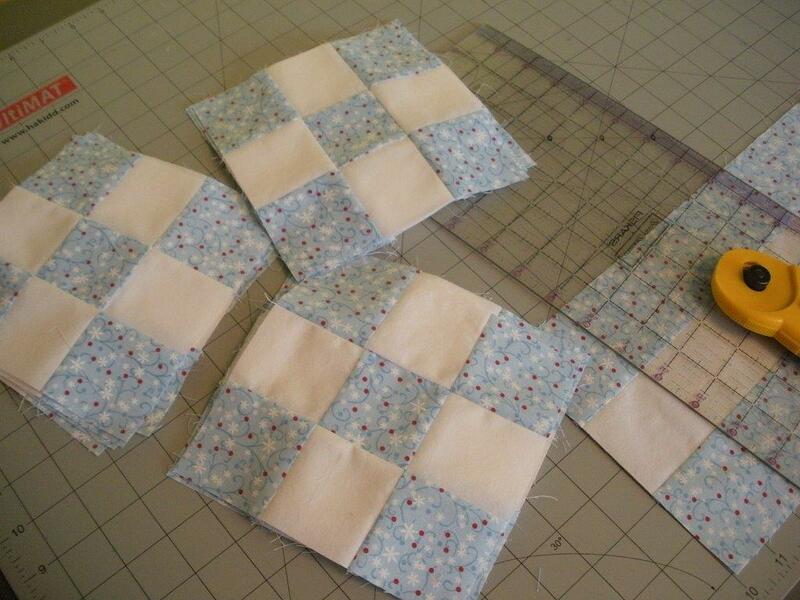 Sewing continuous curves in a square block is particularly satisfying, both in terms of speed and effect. 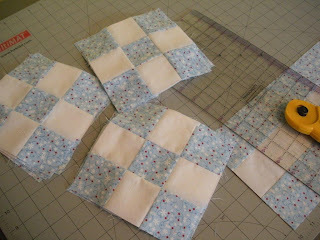 I've chosen to quilt the Nine Patch blocks this way. 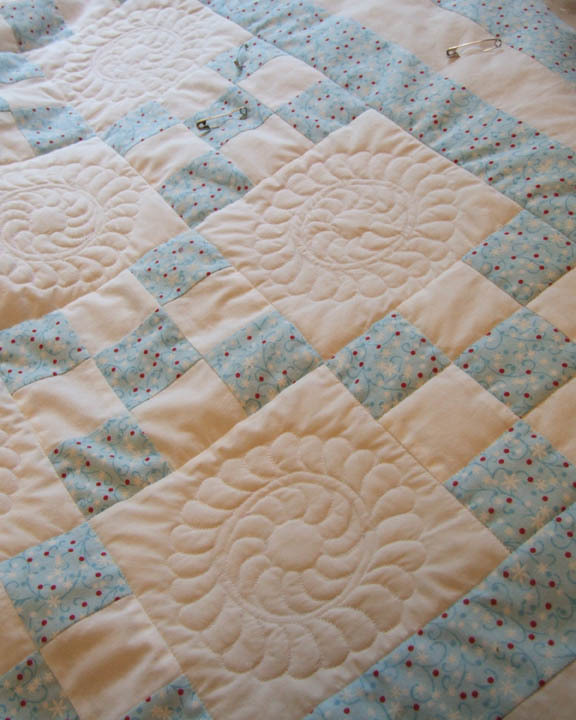 In conversation when folks ask if I quilt by hand or machine, I often say I 'hand quilt by machine'. I've heard long-armers say "your eye corrects the imperfections in your lines" but I don't think that's right at all...I think your eye IGNORES the lines, and focuses instead on the "poufs". What do you zoom in on when you look at these squares? To me it is the pattern created by the gentle puff in each block. Here's where I am so far: the main part is all quilted - continuous curves and feathered wreaths - and now it's time to decide how to do the border. 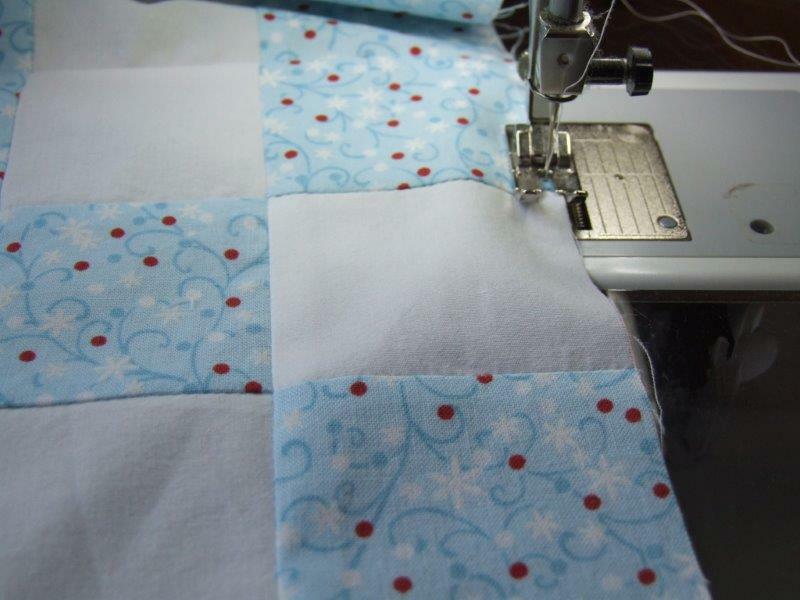 The following quilt was made by local quilter Bernice McMaster; Bernice sent along the picture just to show what she was working on, but it was too pretty not to share. This is a baby quilt which Bernice made for Keillor House in Dorchester, N.B. It will be set up in a frame for staff to demonstrate the art of quilting to visitors and then sold in the fall as a fundraiser for the museum. 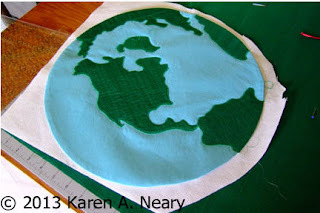 Bernice used 12 different fabrics in this Trip Around The World; the squares are only 1"! 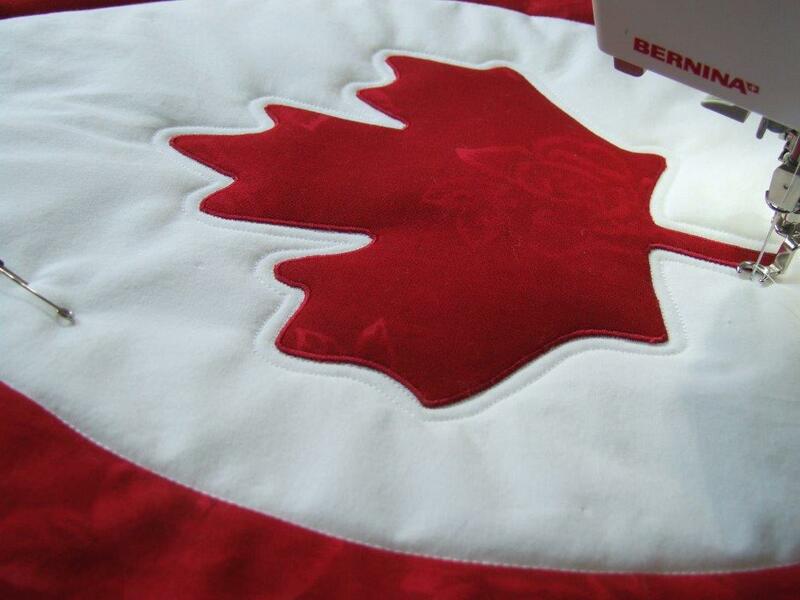 That's a true labour of love, Bernice. 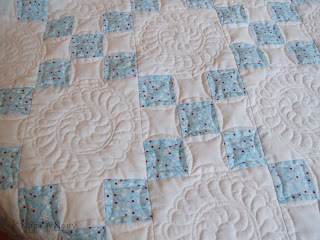 Yesterday I started quilting the blue and white Nine Patch quilt; mine only uses two colours, not twelve! So far I have the feathered wreaths stitched in the plain blocks and will continue on with more free motion in the pieced sections. 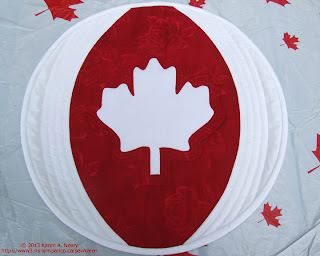 Inspiration for the border has not hit as yet, but usually that becomes clearer when it's under the needle. I've been having a ball getting this fun design patterned up and ready for sale. 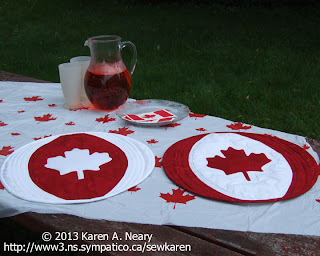 I am very pleased with how the table mats have turned out, and they are super simple to make. They look like beach balls! 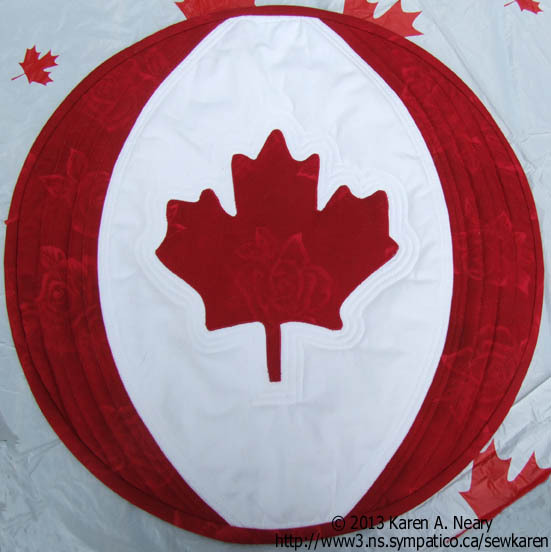 There are only two seams to sew (the maple leaf is fused appliqué). I cannot thank Darlene Gerber enough for her always precise and fast work in testing the pattern. She is amazingly obliging, and works well under a short deadline! I mentioned in a previous post that the red I used is a gorgeous print from the Quilter's Rose collection by Stof. 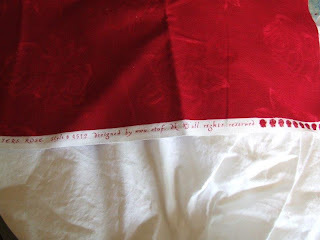 Stof is a Danish company and their fabric is gorgeous; it is available at Mrs. Pugsley's Emporium. I will definitely be using more Stof in future: it has a quality hand and a unique look. These table mats finish to 16" around. 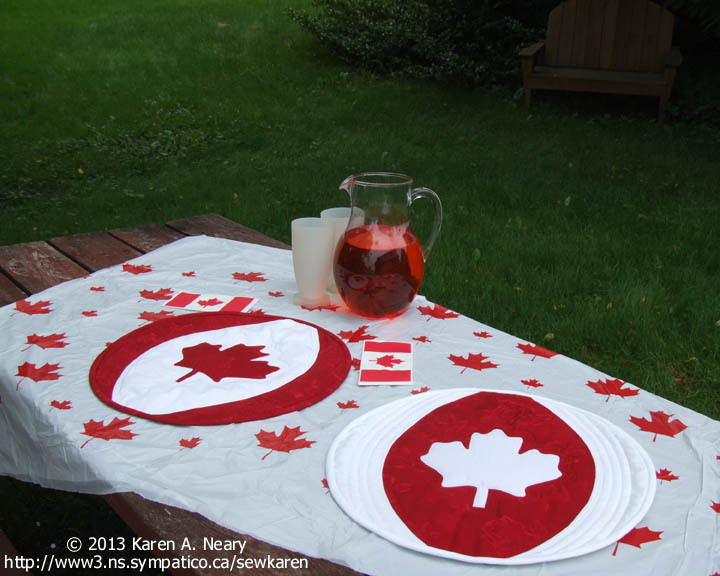 It's a nice size for a centrepiece, or even as individual mats to dress up the table. The clear dinner plate shown here gives you an idea of size. The photos were taken in the backyard and naturally...I had help, this time from Maddie. The pattern is being picked up from the printers this afternoon and the elves will have them ready for mailing by morning. 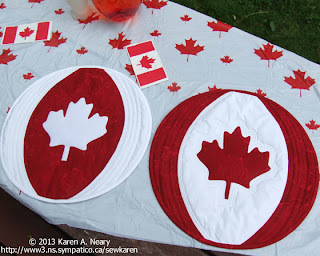 You may not get these made in time for Canada Day this year but in my world, red and white works every day, not just July 1st! Amherstonians were treated to a very special event today: a showing of African quilts. 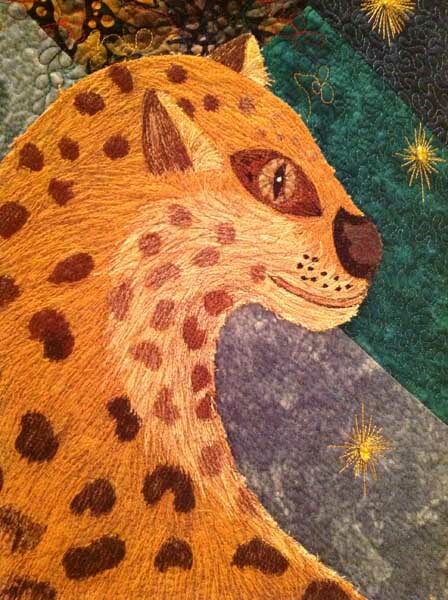 Presented by Zimbabwe quilter Beverley Rebelo, the quilts were part of this year's Out Of Africa exhibit at the London International Quilt Festival. 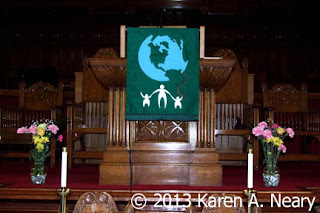 I confess that my attendance was last minute; the magic of scheduled blog posts makes it appear I have been busily stitching along, but in truth I've been away the better part of the last couple of weeks and very behind in my work. I almost didn't go. At the last minute I decided I would regret missing the show and I'm awfully glad I went. I even remembered to take my camera. 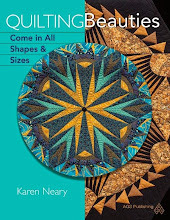 Beverley began with a slide show and talk and then showed us some of these wonderful quilts in person. In "Village Life" she has framed hand-embroidered panels worked by local artists with colourful patchwork. ...and this is the front. Unfortunately, I did not take note of the maker's name. 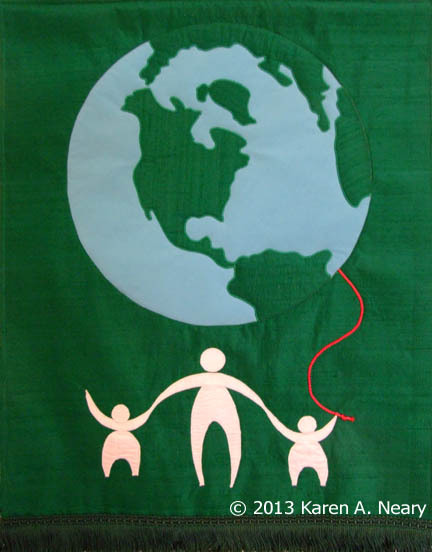 This colourful quilt is appliqued with lizards. Knights of Greystone Park is a quilt which needs to be seen in person; it literally sparkles with little jewels sewn in the night sky. The thread work is amazing. These are "bush babies" climbing a cactus. Look at the quilting detail - wow! 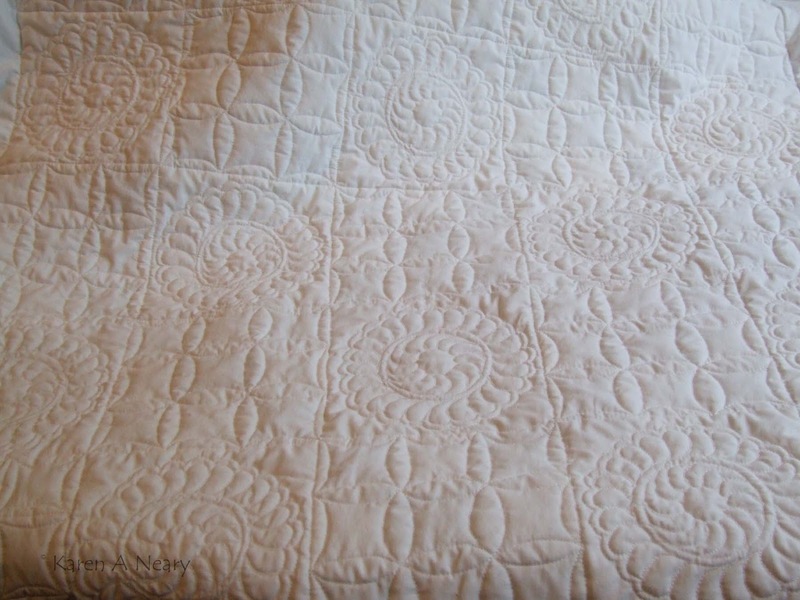 Beverley had a group of smaller quilts stitched by a variety of individuals which she allowed to be passed around the room. Though the picture is out of focus, you get the idea behind this unique piece. I left the house in such a tear that I didn't even have a business card with me, but Beverley I do hope you were able to find this post. 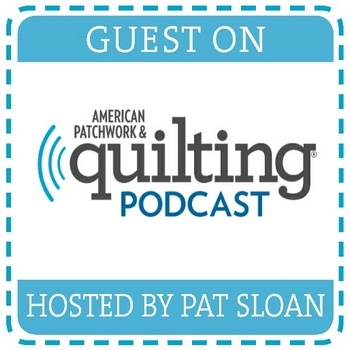 Thank you for a great show; perhaps you will consider returning with more wonderful quilts on your next trip to Canada? I think I finally have things where I want them and will start the sewing today. 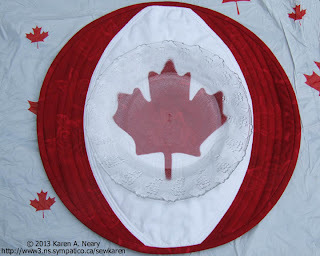 That beautiful red Stof makes an exquisite maple leaf. Stof may be a Danish company but that's a perfect Canadian red! On the way to checking the bees earlier today we passed this very colourful field. 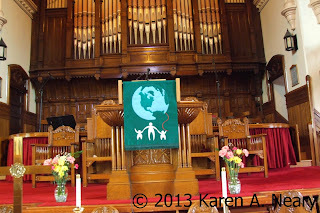 If you are a local, this is Mapleton, Nova Scotia. The red is Sheep's Sorrel. Gorgeous to the eye...but not to the blueberry farmers. 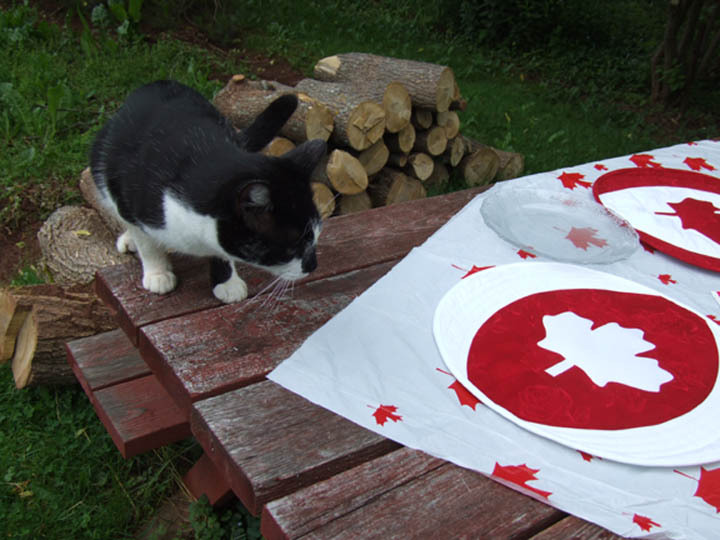 The Nine Patch is smoking along: the top is pieced and the borders are added. I decided to go with a matching block in each corner. 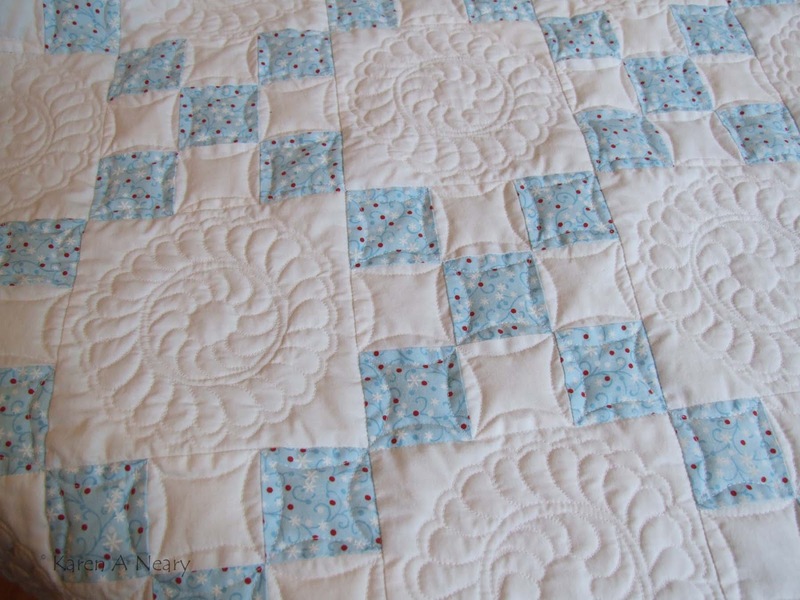 Once it is quilted and the seam lines are no longer obvious, what your eye will see is just that small square in each corner. I like that effect. The final step in sewing is to stitch around the outside of the quilt 1/8" away from the edge, in the seam allowance. 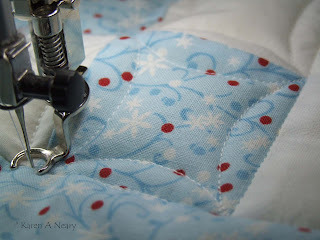 This secures the patchwork at the seam ends and keeps the quilt edges from "ruffling" when basted. 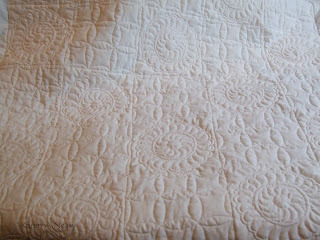 After a good starching and pressing (if you have taken a workshop with me, you have the starch recipe) the quilt will be ready for basting. I heartily dislike basting. :( I procrastinate as long as I can. 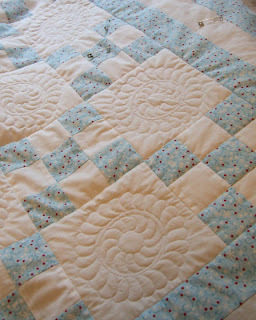 Fortunately, I love to machine quilt so that's incentive to get through the necessary basting step. 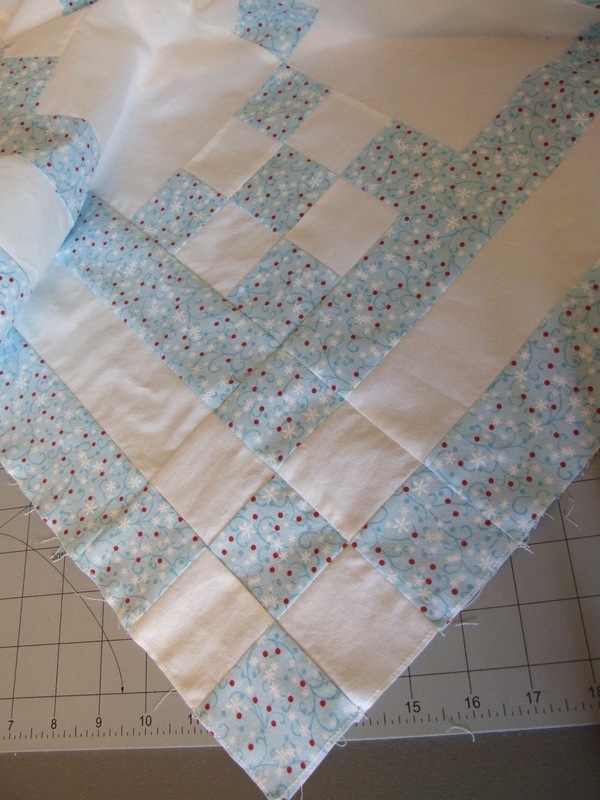 The cool thing about Nine Patch blocks is what they do when you alternate them with a plain block. Can you squint your eyes and see the way the blocks connect diagonally to form a Single Irish Chain? 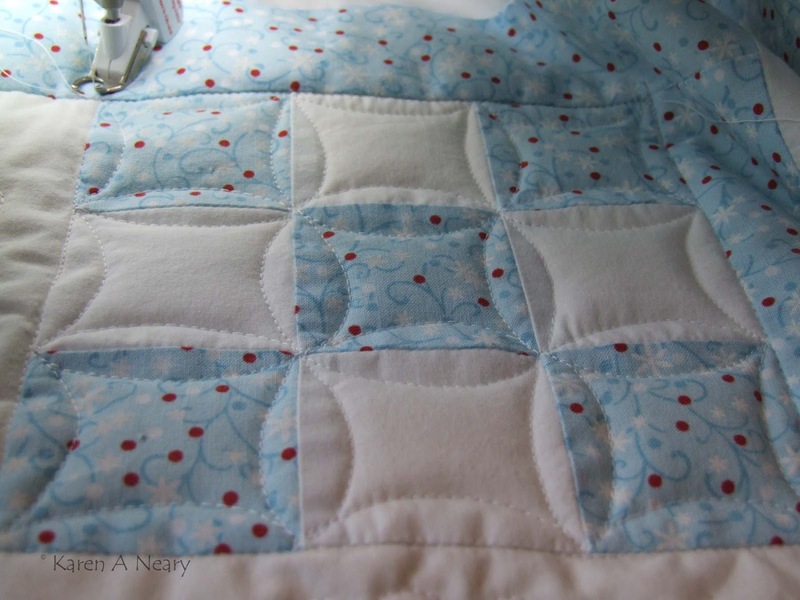 I can't wait to quilt that plain white space! I've been itching to stitch a Nine Patch and this soft blue is working up so nicely. There is beauty in the simplest things. 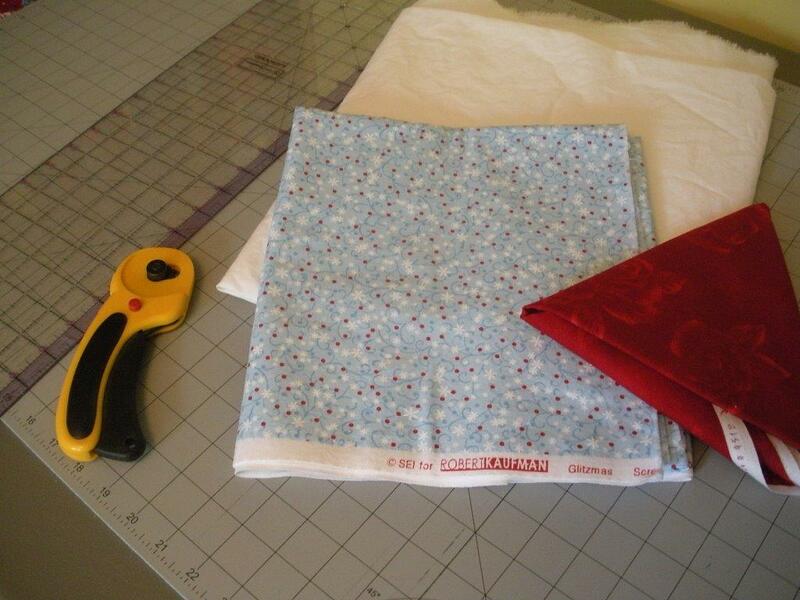 I got new fabric, and a new blade in my rotary cutter. What a great combination - so full of potential! 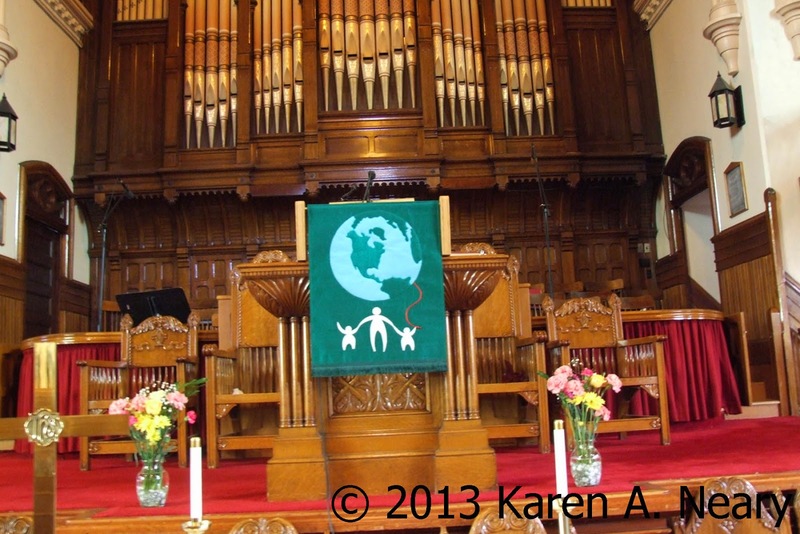 The commissioned antependium was dedicated this morning, 100% silk dupioni background and figures, Chinese silk for the world. 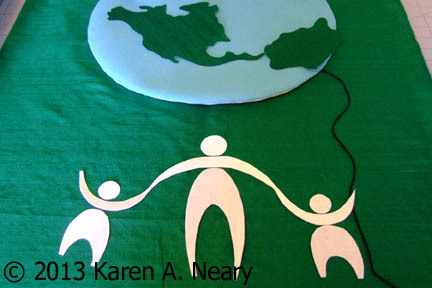 Machine appliquéd with blind and satin stitching. The red cord couched with Invisifil thread. 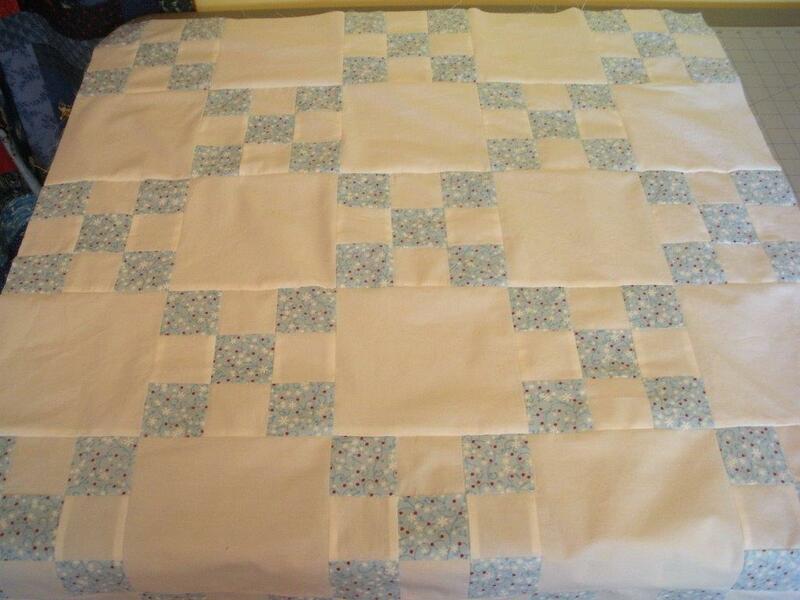 Bottom trimmed with cotton fringe. Most Dads mean the world to their kids. 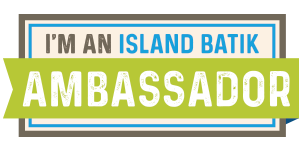 Calling All Maritime Beauty Fans!